All Mamas Must Read! And Not Mamas too. Really. This article was simply much too awesome NOT to share. 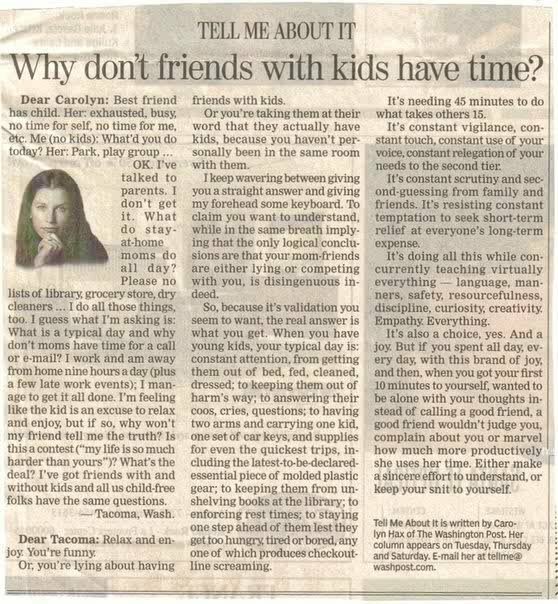 For all you mamas who have struggled with friends or family that have been less than understanding when it comes to your time, and how you spend it once you have small children… well mamas, this one’s for you! LOVE! I work as a Recruiter (now on mat leave with my second child) and I’ve heard one of my younger colleagues comment on a candidate for a job, who happened to be a mother on maternity leave. The comment was something to the effect that ‘why does she not have time to interview, she is on mat leave, for god’s sake, time is ALL she has’. I smiled. I’m going to share this on my personal Facebook page, love it! Thank you Katia for sharing!